Signed by Toronto out of Mexico as a 16-year-old international free agent on Aug. 3, 2011...Prior to signing with the Blue Jays, played one season (2011) in the Mexican League at the age of 15...made 13 appearances for Mexico City, including two starts...His uncle, Antonio Osuna, pitched 11 seasons in the Majors from 1995-2005 for the Dodgers, White Sox, Yankees, Padres and Nationals...Was named the recipient of the 2016 National Sports Award, handed out annually by Mexico's National Commission for Sport...was presented the award by Mexican president Enrique Peña Nieto at a ceremony in Mexico City...Acquired by the Astros at the trade deadline last season in exchange for three right-handed pitchers, including former closer Ken Giles...was arbitration eligible for the second time in his career this offseason...signed to a one-year contract for the 2019 season on Jan. 11, 2019. In 38 appearances combined between Toronto (15g) and Houston (23g), went 2-2 with 21 saves in 22 opportunities, posting a 2.37 ERA (10ER/38IP) with four walks and 32 strikeouts...ranked 11th in the AL in saves and third in save percentage (95.5%)...with the Astros, went 2-2 with 12 saves and a 1.99 ERA (5ER/22.2IP) in 23 games...walked three batters and struck out 19...became the third pitcher in Astros history to successfully save each of his first 12 opportunities with the club...also Fred Gladding (14 from 1968-69) and John Hudek (12 in 1994)...ranked second among AL relievers in walks per 9.0 innings ratio (0.95) and third in strikeout-to-walk ratio (8.00)...began the season with the Blue Jays, making 15 appearances...recorded six straight saves for Toronto to begin the season in April...notched his 100th career save on April 10 at BAL...at 23 years, 62 days old, became the youngest pitcher in MLB history to reach 100 career saves, surpassing Francisco Rodriguez (24 years, 246 days old in 2006)...was placed on the restricted list on May 8, which finished his Toronto career at 104 saves, the third-most in the history of the franchise....received a 75-game suspension from MLB on June 22, which included games already missed...did not pitch again until July 14 with the GCL Blue Jays...worked across three levels in the Blue Jays system in anticipation for his activation...was traded to Houston on July 30 in exchange for three right-hand pitchers: Ken Giles, David Paulino and Héctor Peréz... immediately reported to Double A Corpus Christi, making one appearance...combined to toss 7.0 scoreless innings in seven minor league games in the Blue Jays and Astros system on his rehab assignment...activated from the restricted list on Aug. 5...quickly worked his way into the closer role, saving 12 games in 12 opportunities for Houston...got his first win of the season in his first outing with the Astros on Aug. 6 vs. SF...picked up two straight saves against his former club from Sept. 24-25 at TOR... pitched in four games in the postseason, recording one save with a 7.50 ERA (5ER/6IP) and five strikeouts...his ERA was skewed by a five-run outing in Game 3 of the ALCS vs. BOS (gave up a grand slam)...was scoreless in both of his games of the ALDS vs. CLE (Game 1 and Game 2)...picked up the save in Game 2 of the ALDS vs. CLE after tossing the final 1.1 innings in the Astros 3-1 win...improved to 3-for-3 in save chances in his postseason career... had his postseason scoreless innings streak snapped at 11.1 innings pitched (nine games) in Game 3 of the ALCS... allowed five runs on three hits, including a grand slam by ALCS MVP OF Jackie Bradley Jr. Recorded a career-high 39 saves, the 2nd most in a season in franchise history (Ward - 45 in 1993) and 2nd most in the AL (Alex Colome - 47) ... Became the 1st Toronto pitcher with back-to-back seasons of 35+ saves…Became the 1st pitcher in MLB history with multiple 35+ save seasons before the age of 23 ... Among AL relievers, ranked 1st in SO/BB (9.22), 1st in BB/9 (1.27), 6th in WHIP (0.86) and 7th in HR/9 (0.42) ... Posted personal bests in strikeouts (83), SO/9 (11.67), WHIP, BB/9, opponents' OBP (.234) and SLG (.274), HR/9, XBH allowed (11) and pitcher WAR (2.1) ... Recorded 10 blown saves, the most in the Majors and 3rd most in club history (Ward-12 in 1989; McLaughlin-11 in 1983)… His 49 save opportunities ranked 2nd most in franchise history (Ward - 51 in 1993) ... Became the 4th pitcher in team history with at least three seasons of 20+ saves, only Tom Henke had more (7) ... Of his 39 saves, only three were longer than one inning ... Struck out the side eight times ... Converted 22 consecutive save opportunities from April 29 - July 17, the 4th longest such streak in team history (2nd longest within a season, Henke-25 in 1991) and 3rd longest in 2017 (Jansen-24, Holland-23)...Over that span of 33G, he posted a 0.86 ERA (3 ER/31.1 IP) with 4BB, 43K, and an opp. avg. of .121 (13-for-107, 4-XBH) ... Faced his first 26 left-handed batters of the season without issuing a walk...Did so for the first time on May 23 at MIL ... Collected six saves from May 21-31, becoming the 3rd Blue Jay (4th time) to save at least 6G in any 9G span of a season (Duane Ward in 1991 & 1993, Kelvim Escobar in 2002) ... Went 8-for-8 in save situations in May (14 games, 1.42 ERA, 0.71 WHIP, .159 AVG) ... Was named AL Reliever of the Month for June, allowing just 1 ER in 11.2 IP (8SV, 0.79 ERA, .105 AVG, 1BB, 19K) ... Was named to the All-Star Game as a replacement on July 7…At 22 yrs, 154 days old, would become the youngest player to appear in ASG in club history (previous: Dave Stieb, 22yrs, 352 days in '80 - courtesy of STATS) ... Became the first Blue Jay to record a save on three straight days (July 4-6) since Casey Janssen (Aug 29-31, 2012) ... Made his 1st appearance in an All-Star Game (1.0 IP) on July 11…Became the first Toronto pitcher since Roy Halladay in 2008 to throw a scoreless inning in an ASG...Became the 7th Toronto reliever to participate in an ASG (last: Cecil/Delabar in 2013) ... At 22 years and 134 days old on June 21 at TEX, he became the youngest player in MLB history to record 75 saves (next youngest: Huston Street - 24y, 42d) ... On July 27 vs. OAK, won his 3rd game of the year and his first since May 10 vs. CLE (1.0, 1K) ... Took his 1st loss (1.0, 3ER, 2H, BB, K) on July 29 vs. LAA, his first since Sept. 28, 2016 vs. BAL…The 3ER were his most allowed in an outing since Sept. 19, 2015 vs. BOS (3ER) ... Suffered a blown save and the loss (0.2, 5H, 4ER, K) on Aug. 6 at HOU…The 4ER and 5H allowed were career highs ... Walked two batters in a game for just the 3rd time in his career (last: Oct. 3, 2015 at TB) ... After posting a record of 1-3 while going 5-for-9 in save opportunities with a 9.64 ERA (10 ER/9.1 IP) over a 10G span from July 18-Aug. 6, converted four straight saves from Aug. 8-17 (5G, 5.1IP, 0ER) ... Saved his 35th game (1.1IP, 2K) on Aug. 31 at BAL for his 13th career save of more than 1.0 IP (3rd in 2017) ... On Sept. 5 at BOS, suffered his 10th blown save and 2nd in as many opportunities…Marked his 3rd time in 2017 to have suffered a blown save in back-to-back opportunities ... Saved his 36th game on Sept. 15 at MIN to match his previous career high from 2016, his first appearace since Sept. 5 (away from team for birth of child) ... Converted each of his last four save opportunities, allowing no hits and no walks while striking out seven batters over five innings...Made his 39th save on the final day of the season, Oct. 1 at NYY (1.0IP, K). in with RISP (minimum 10 at-bats) ...Recorded his second career 5-out save in the playoffs in game two of the ALDS…Joined Duane Ward as the only Toronto pitchers to earn two 5-out saves in the postseason in club history...Struck out each of the four batters faced Sept. 21 at SEA…It marked the 2nd time in his career to strike out that many in an outing (last: 5-SO on June 22, 2015)...Collected six, four-out saves in 2016...Recorded his 30th save on Sept. 4 at TB becoming the youngest player to reach 30-SV in a season since 1969, when saves became an official statistic…The previous youngest was Neftali Feliz, who was 22 when he saved his 30th game of 2010 (TEX)…Also became the 11th different TOR-pitcher to record a 30-SV season & first since Casey Janssen in 2013 (34)...The save marked his 50th career...Suffered his 3rd blown save Aug. 19 at CLE suffered jand first since June 7 at DET, snapping a streak of 14 straight converted saves…Surrendered back-to-back HR (including walk-off inside-the-park HR) after retiring the leadoff hitter…It marked the first time he allowed 2-HR in a game…Both HR came with 2 strikes (Santana's game-tying HR came on 0-2 count)...Collected his 47th career save Aug. 17 at NYY (52nd SVO), becoming youngest pitcher in ML history to record that many saves prior to their 22nd birthday (previous record: Terry Forster-46)...Snapped a streak of 71 RHB without issuing a walk, Aug. 1 at HOU (intentional)...Was his first walk issued to a righthanded hitters since May 15 at TEX...Hit two batters in a game for the first time in his career July 26 vs. SD…Entering the contest had hit only two batters in his career, a span of 112G (114.0 IP)...Recorded his 100th career strikeout May 26 at NYY (Alex Rodriguez, who was also his first career SO victim)...Joined Miguel Batista (2005) as the only pitchers in club history to save the team's first two games of a season...At then 21.056 years of age, became the youngest pitcher in MLB history to record a save on Opening Day…Recorded the final three outs in the victory at TB. Among AL relievers finished 6th in innings pitched (69.2) & 7th in opposition average (.192). His 20 saves were second most by a TOR rookie in club history (Koch-31 in 1999)… It was the most saves by an AL rookie since Addison Reed had 29 with CWS in 2012…It was the 5th most by an AL rookie since 2010. Earned his 20th SV of the year September 28 at BAL… The only other pitcher to save 20 games in one season at age 20 or younger was Terry Forster, with 29 saves for the White Sox in 1972. Became the first rookie relief pitcher in MLB history to appear in 67 games in a season when younger than 21 years old (next closest - Terry Foster, 62G in 1972). Allowed seven home runs, with four of those coming in September. Surrendered a career-high three earned runs September 19 vs. BOS. Recorded four saves of 4+ outs becoming the youngest TOR pitcher with multiple saves of 4+ outs in a season since Victor Cruz of TOR (20 years old, 6-SV of 4+ outs) in 1978. Suffered his 1st blown save since he became the closer on June 22 (2nd on season, 16-for-18) on Sept. 1 vs. CLE… Prior to blowing the save had converted 16 consecutive save opportunities which was the longest active saves streak at the time. Earned his first career save on June 22 at TB by pitching two scoreless innings & striking out five…The only other pitcher to post their first ML save while recording at least five SO & pitching no more than 2.0 IP was T.J. Mathews (STL) in '95. Was ejected in the 8th inning after hitting Adam Jones vs. BAL, June 19….Was his first career ejection. Began his season with 9.2 scoreless innings…Did not allow a home run in his first 24.2 innings to start his career…On May 31 at MIN that streak was snapped by HR to Plouffe. Earned his 1st career win (1.2 IP, 1H, 0R, 2K) vs. LAA on May 18, becoming the youngest Blue Jay to win a game in franchise history. April 8 at NYY made his Major League debut retiring both batters faced, stranding the bases loaded…At 20.060 days old became the youngest pitcher in club history to appear in a ML game…Miguel Castro, who made his debut on April 6 at NYY (20.103) previously held the record. Earned his first career postseason save in game five of the ALDS vs. TEX, becoming the youngest pitcher in AL history to record a save in the postseason...Became the fourth pitcher in club history to record a 5-out save in the playoffs (Ward, 2x & Henke). Became the second Blue Jays pitcher in team history to pitch more than five innings without allowing an earned run in a single playoff series after tossing 5.2 scoreless in the ALDS (Jim Acker, 1985). Retired the first 17 batters he faced in the playoffs before surrendering a home run to Kendrys Morales in game three of the ALCS…That streak is the second longest streak of its kind in franchise history (Price-18 consecutive batters retired)… It was the most consecutive batters retired by a pitcher in their first postseason since Rick Porcello with DET in 2011 (18 straight)…Became just the second player in postseason history to retire that many batters in a row when playing in their rookie season in MLB. After appearing in game three, became the third youngest pitcher ever to appear in an ALCS game (Bert Blyleven, 19 years old in 1970). Suffered the loss in the ALCS-clinching game after allowing the go-ahead run in the 8th inning in a Kansas City 4-3 victory. His 2.16 ERA in the playoffs is the seventh lowest among Blue Jays relievers in club history…Ranks as the second lowest ERA by a TOR rookie reliever in the postseason behind Aaron Sanchez (0.00 ERA). 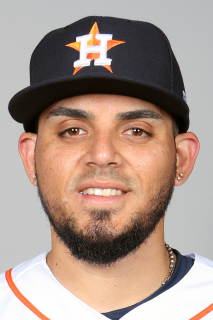 August 5, 2018 Houston Astros activated RHP Roberto Osuna from the restricted list. August 3, 2018 sent RHP Roberto Osuna on a rehab assignment to Corpus Christi Hooks. July 24, 2018 sent RHP Roberto Osuna on a rehab assignment to Buffalo Bisons. July 17, 2018 sent RHP Roberto Osuna on a rehab assignment to Dunedin Blue Jays. July 14, 2018 sent RHP Roberto Osuna on a rehab assignment to GCL Blue Jays. May 8, 2018 Toronto Blue Jays placed RHP Roberto Osuna on the restricted list. April 11, 2017 Toronto Blue Jays activated RHP Roberto Osuna. April 2, 2017 Toronto Blue Jays placed RHP Roberto Osuna on the 10-day disabled list retroactive to April 1, 2017. Cervical spasm. April 5, 2015 Toronto Blue Jays selected the contract of RHP Roberto Osuna from Dunedin Blue Jays. January 28, 2015 Toronto Blue Jays invited non-roster RHP Roberto Osuna to spring training. September 11, 2014 RHP Roberto Osuna assigned to Mesa Solar Sox. August 1, 2014 RHP Roberto Osuna assigned to Dunedin Blue Jays from Lansing Lugnuts. July 8, 2014 Lansing Lugnuts sent RHP Roberto Osuna on a rehab assignment to GCL Blue Jays. March 31, 2014 Lansing Lugnuts placed RHP Roberto Osuna on the 7-day disabled list. September 23, 2013 Lansing Lugnuts activated RHP Roberto Osuna from the 7-day disabled list. July 4, 2013 Lansing Lugnuts placed RHP Roberto Osuna on the 7-day disabled list. June 9, 2013 Lansing Lugnuts activated RHP Roberto Osuna from the 7-day disabled list. May 1, 2013 Lansing Lugnuts placed RHP Roberto Osuna on the 7-day disabled list. April 1, 2013 RHP Roberto Osuna assigned to Lansing Lugnuts from Vancouver Canadians. August 25, 2012 Roberto Osuna roster status changed by Vancouver Canadians. August 17, 2012 Vancouver Canadians placed RHP Roberto Osuna on the temporarily inactive list. July 25, 2012 RHP Roberto Osuna assigned to Vancouver Canadians from Bluefield Blue Jays. June 17, 2012 Roberto Osuna assigned to Bluefield Blue Jays. August 30, 2011 Toronto Blue Jays signed free agent RHP Roberto Osuna to a minor league contract. June 10, 2011 Diablos Rojos del Mexico placed RHP Roberto Osuna on the reserve list. April 11, 2011 Diablos Rojos del Mexico signed RHP Roberto Osuna.